When it comes to tourism, Karnataka is the fourth most popular holiday destination in India. One of the reasons, this state is so popular is because of its ornate temples like the Sri Mahalakshmi Temple in Goravanahalli. As the name suggests, this temple is dedicated to Goddess Mahalakshmi, the wife of Lord Vishnu and the Goddess of prosperity and wealth. Maha Mangalarathi Timings: 9:30 AM, 12:30 PM and at 7:30 PM. 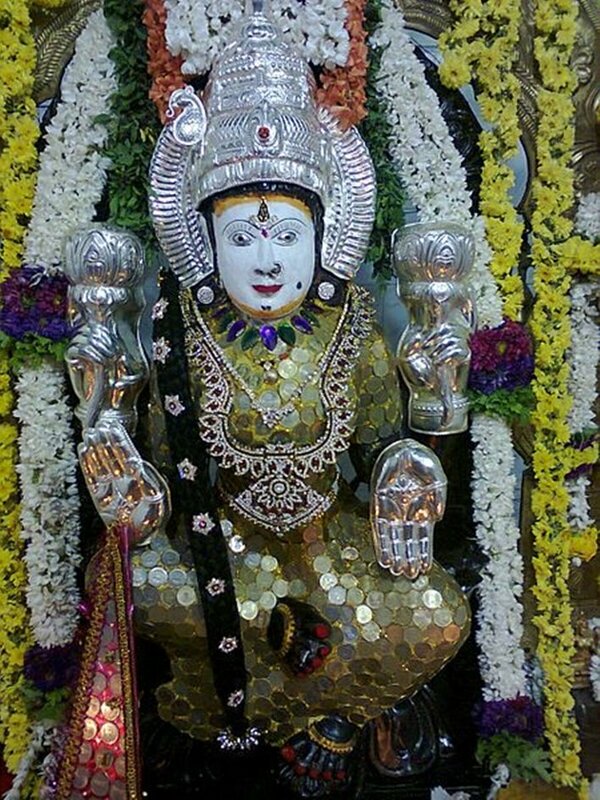 The main idol of Goddess Mahalakshmi in the temple is believed to be self-manifested. According to local historians, in the early 1900s, a villager named Abbayya came into possession of this idol. He worshipped the idol at home and was blessed with wealth and prosperity. His home soon came to be known as Lakshmi Nivas in honor of his charity work. Abbayya brother’s Thotadappa also worked alongside Abbayya and worshipped the Goddess Mahalakshmi. One night the Goddess visited him in his dreams and asked him to build her a temple. Thus Thotadappa built a temple for the Goddess and began worshipping the idol in this shrine. After Thotadappa’s death, Chowdavya began performing the poojas for Goddess Mahalakshmi. Little is known about what happened next but for fifteen years between 1910 and 1925, the temple was abandoned. In 1925, a pious devotee, Kamalamma arrived in Goravanahalli and found the temple in a deserted state. She brought the temple back to life and started performing poojas once again for the Goddess but for some reason, left the place after a year. It was around 26 years before she came back to the Temple and re-established it in 1952. From then on, the temple became a pilgrimage spot for Goddess Mahalakshmi’s devotees. The Sri Mahalakshmi Temple in Goravanahalli is a beautiful example of the typical South Indian architecture in the 1900s. The temple features a large, multicolored Gopuram with smaller arches on both sides. The temple also has verandahs on either side. The main deity is housed in the Garbhagriha or the sanctum sanctorum. Other deities such as the Nag Dev and Marikamba are also housed in the temple. The temple is open to the public all through the year. Tuesdays and Friday are considered especially auspicious. 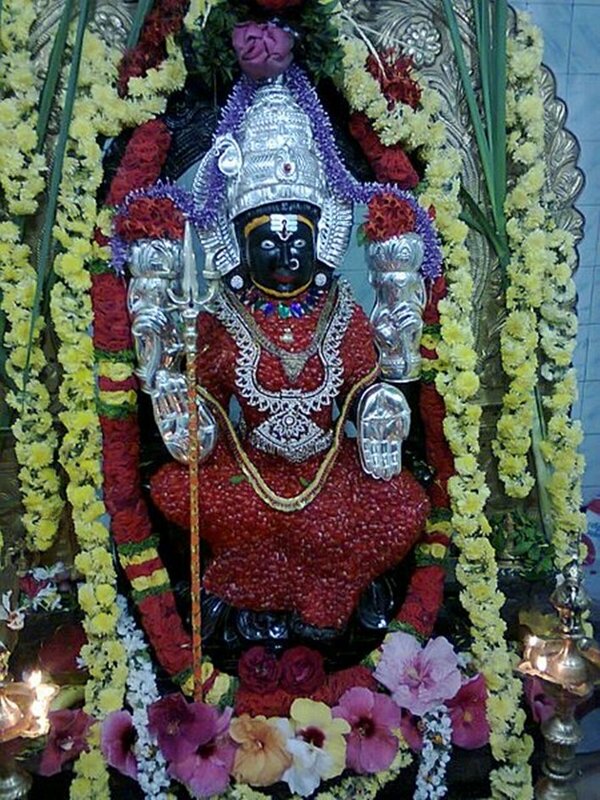 If you would like to attend the Pooja, Abhisheka and Kumkuma Archane are performed at 8 am to 9.30am and the Maha Mangalarathi is performed at 9:30 am, 12:30 pm and at 7:30 pm. The temple is closed between 12.30pm and 5.30pm. Lakshadeepotsava is the most important festival at this temple. Theetha Reservoir: The temple is built close to the Theetha reservoir on the River Suvarnamukhi and is surrounded by natural beauty. Temples: A number of other temples such as the Oni Nagappa Temple and the Renukamba Temple are a short drive away from the Sri Mahalakshmi Temple. Bankapura Peacock Sanctuary: A little less than 300 kms away is the beautiful Bankapura Peacock Sanctuary. This Sanctuary is spread over 139 acres and boasts of over 1000 peacocks and peahens and the ruins of the Bankapur Fort. Goravanahalli is easily accessible by road, rail or air. Bangalore, the capital of Karnataka is the closest city to Goravanahalli. The Bangalore International Airport caters to domestic and international tourists and is a mere 80 kms from the temple. The closest railways station is located 36 kms from the temple at Tumkur. A number of trains stop here on a daily basis including the Jan Shatabdi Express for Hubli, the Ranichennama Express and the Golgumbaz Express. KSRTC and Private Buses ply regularly between Bangalore and Gorvanahalli. Alternatively, you could choose to hire a cab from Bangalore or drive yourself.